So I’m being very brave the morning after the night before and coming to terms with the fact it’s no longer Halloween season! Always new challenges and highlights of each month though. November has in recent years been adopted as the month for awareness of male I’ll health, cancers and mental health. And the symbol for this is the moustache. Traditionally men are challenged to start the month clean shaven and grow a moustache for the month which is renamed Movember for the challenge. Tempted as I am to attempt my own moustache, I decided instead to show my support of the cause through the media of nailart! Yes I know I’m a wimp! 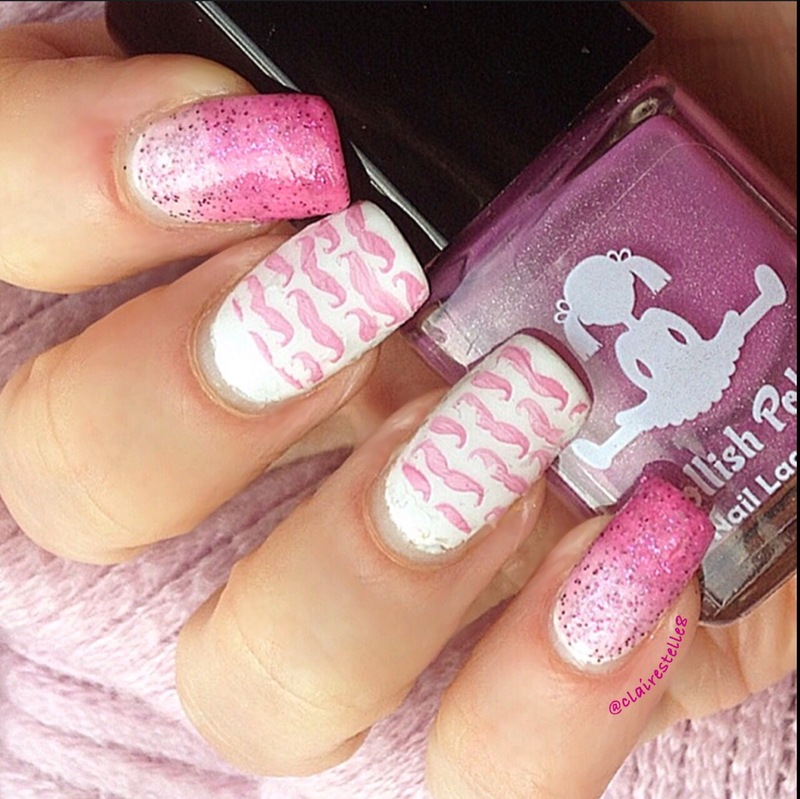 For this mani I used Dollish Polish Truly Madly Deeply on my outer fingers. This is a beautiful thermal pink crelly that shifts from pale creamy pink to a deep raspberry when cold. And filled with a sparky sprinkle of tiny pink glitters! I love this thermal. It’s so sensitive but I think I managed to capture its transition. 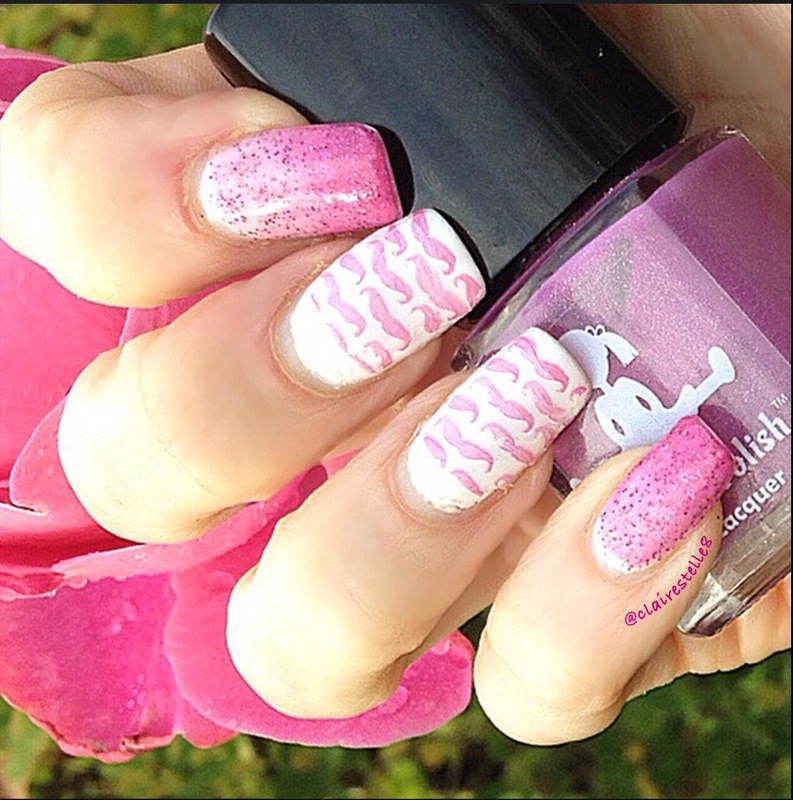 For the art I used a Moyou Tourist plate image of moustaches and stamped over a white base with another Dollish Polish – Wild Orchid, a beautiful vibrant orchid with a scattered holo. More details about how you can support Movember can be found at http://www.movember.com. Dollish Polishes can be purchased at http://www.dollishpolish.bigcartel.com and be sure to follow Dolly on IG at http://www.instagram.com/dollishpolishlacquer for shop updates. ← My last Halloween manis for this year! Sob!